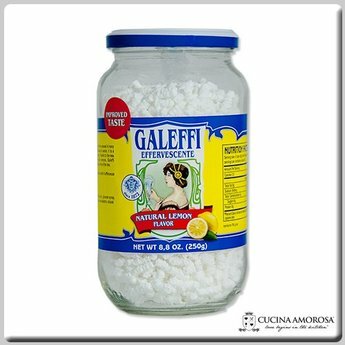 These Effervescent granules are a popular drink mix served in many Italian households just after meal. Once dissolved in water, it a pleasant tasting, thirst quenching and refreshing. Thanks to the new recipe that contains juice from finest Italian lemons. Galeffi Effervescent is even more flavorful. Try a glass any time of the day. Ingredients: sugar, sodium bicarbonate, malic acid, glucose syrup, natural flavors, dehydrated lemon juice (lemon juice, maltodextrin, natural flavor, alpha tocopherol), FD&C Blue 2.